For 2018, we will introduce the Mesh Tent 1, a perfect choice for the minimalist warm weather backpacker. It weighs only 410 grams (15 oz), offers ultralight protection from nighttime insects, and can be set up with trekking poles or by suspending the ridgeline. When paired with the our Tarp 5, the combo offers a very light warm weather shelter solution weighing only 730 grams (1 lb 10 oz) in total. Also new is the two-person Windsack 2, a lightweight, highly versatile emergency bivy bag that is a winter backcountry essential. 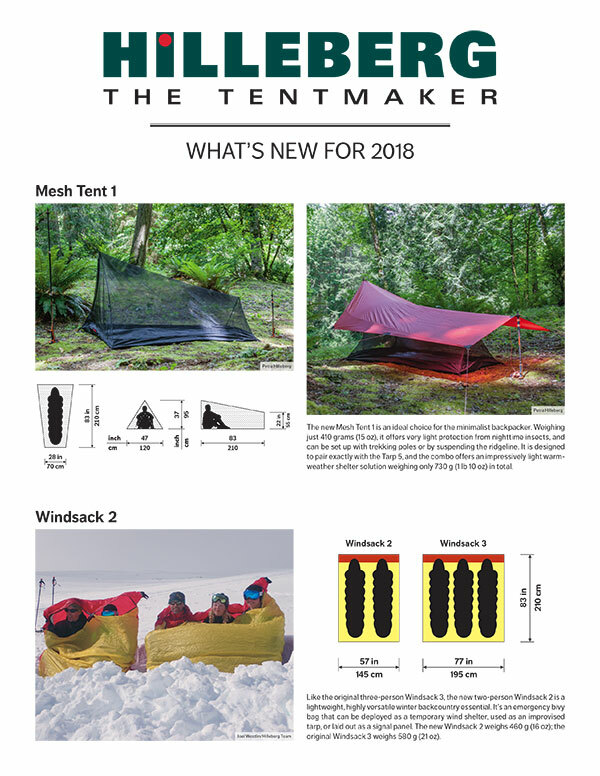 Like the original three-person Windsack 3, the Windsack 2 has a breathable front panel and waterproof back, and can also serve as a temporary wind shelter, a signal panel, or a tarp. In addition, all Yellow Label tents and all Tarps will be available in sand color, as well as green and red.